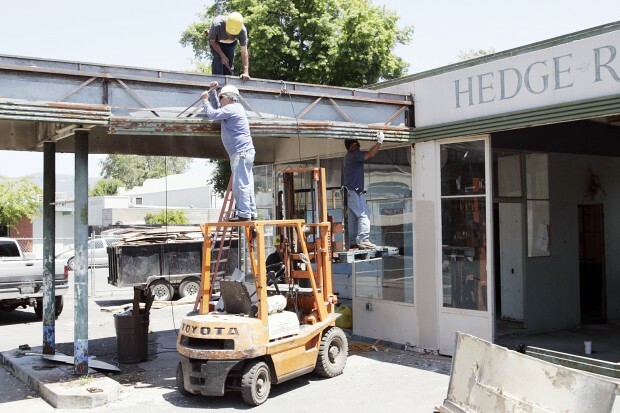 Workers take down the facade of a 63-year-old gas station in Napa. This week, a demolition crew began dismantling the façade of a 63-year-old former Union gas station on Napa’s Third Street that had been called one of Napa County’s “10 Threatened Treasures.” The structure was valued by some as a significant part of Napa’s historical and architectural legacy, and the original demolition request was denied by the city’s Cultural Heritage Commission in 2009. But since then no takers came forward to purchase and relocate the structure, giving the owners the go-ahead to take it down. Renowned sports agent Leigh Steinberg spoke to members of the Marin County Bar Association last week in San Rafael. Steinberg has represented more than 150 professional athletes, including former 49er Steve Young and former Giants’ manager Dusty Baker, and was the inspiration for the hit 1996 film “Jerry Maguire,” starring Tom Cruise. More than 70 people were there to hear Steinberg reminisce, talk about his core values, and discuss personal struggles. Steinberg received his law degree from UC Berkeley and now practices law in Southern California. Frank Chong was officially installed Thursday as the new president of Santa Rosa Junior College, although he has been on the job since January. Only the fifth president in the school’s 94-year history, Chong formally took office and discussed his vision for the college at an annual community luncheon. “We are in the business of being dream makers,” he said, although steep cutbacks in state funding in recent years will force the school “to be entreprenurial and be more creative” in the years ahead. Four penguin chicks will be on display until the end of June at the San Francisco Zoo. Four new chicks have been spotted at the San Francisco Zoo recently — Magellanic penguin chicks, that is. They are native to the Straight of Magellan, off the coast of southern Chile, and can also be found in Argentina, the Falkland Islands, and Brazil. The baby penguins hatched this week and will be on display until the end of June, when they will begin “Fish School,” where they will learn to swim and be hand-fed by zookeepers. Sitting on the border of Alameda and Contra Costa counties, the Altamont Pass area is home to one of the nation’s oldest wind farms. The turbines were first put up in the 1970s, and this week marked the completion of the first phase of a massive “repowering” project that is scheduled to run through 2015. The repowering project is intended to return the landscape to a more natural state with the removal of power lines and antiquated equipment and to reduce the number of birds killed in the spinning turbines.